The first thing you’ll notice when launching Proshow 5 is the slick new look. In a “darkroom” vein, the windows all look professional and have a contemporary layout and design. This might not make you any faster using it, but it makes it feel smoother and more fun. Large buttons guide you to preset workspaces for Build, Design and Layout, ala the newer versions of Adobe’s products. The ProShow 5 wizard lets you create a straightforward slideshow with just a few clicks. If you’re interested in an easy way to show off your photos, the wizard may be enough to get you up and running. Of course you can use it as a baseline and customize from there. If nothing else it helps you get through the initial steps of adding your images, videos and music, as well as setting the backgrounds, transitions and theme. Image editing controls have gotten simpler to use, and now closely resemble those found in popular programs like Adobe Lightroom and Adobe Photoshop. Masks and adjustment layers are also available for tweaking your images without having to go back to Photoshop and create a new version for your slideshow. There are too many small improvements to the user interface to list them all here, but suffice it to say that ProShow is now simpler, quicker and more fun to use. Different pieces of the program now do a better job of sharing interface look and feel, as well as more intuitive commands for bringing up editors and other dialogs. Transitions and slide styles are two of my favorite features in ProShow 5. I don’t like to overdo them, especially transitions, since it risks making your viewers seasick, but tastefully mixing in some unusual transitions can add some variety and excitement to a show. Similarly Styles can make even ordinary photos fun (I’ve used some fancy multi-image styles when making shows out of images contributed by parents of their children for a school event, for example). 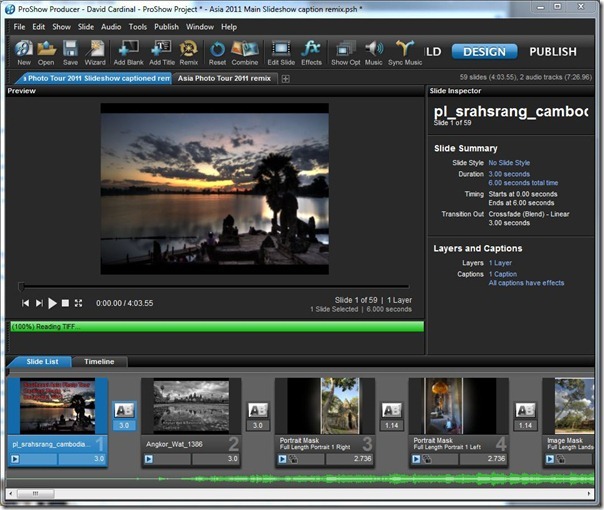 ProShow 5 includes dozens of new transitions and styles – bringing the program to a total of 780. For starters that means you don’t need to bore your viewers and clients by using the same ones over and over again. There are plenty of options allowing for a large variety of looks. Some of the coolest new effects allow tilting your images in 3D. If you make your living with standout slideshows, you can push the envelope even further by using ProShow to create custom effects with the included keyframing capability, which works with layers, adjustment layers, masks and effects to allow you to create just about any look or style you can imagine. It’s easier than ever to add motion effects, simply by clicking and dragging images to create pan, zoom and 3D. You might think that all these new features come at a price in performance. But ProShow 5 now makes better use of your GPU so playback and rendering is actually faster than before. Audio fading and trimming is easier than ever, and new music sync capability has been added. Audio is one area where ProShow is miles ahead of other slideshow products such as Powerpoint. As always ProShow offers a variety of branding options, including watermarks, startup videos and captions while your slideshows load, and completely flexible menus for DVDs or Executable slideshows. 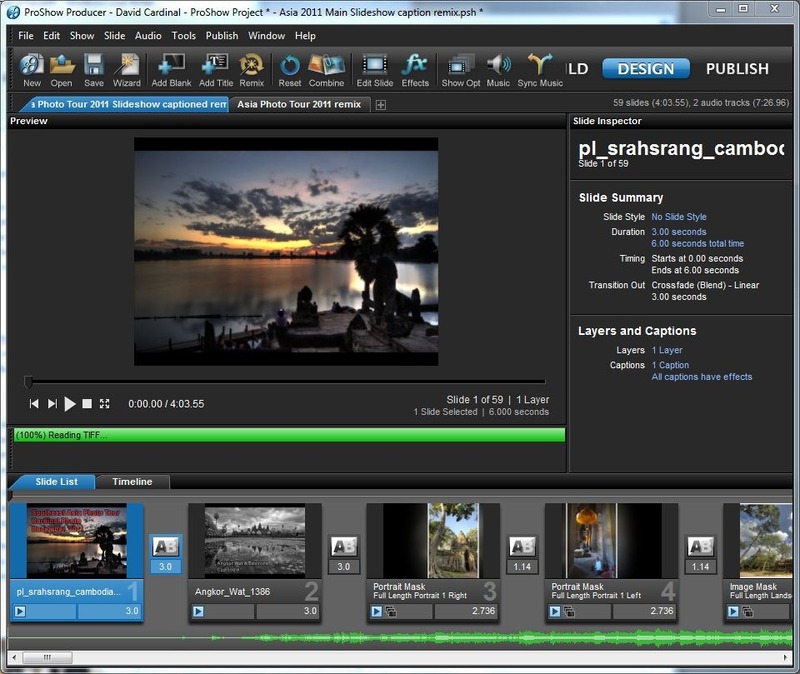 With ProShow Producer 5, image capabilities are extended to fully support videos. Video can not only be included in shows, but can be blended together with images, trimmed, and have effects like black and white or sepia added. You can quickly create “slo-mo” versions of your videos and even apply slide styles to them. Proshow 5 now supports more publishing options, bringing the total to over 40, including DVD, Blu-Ray, YouTube and Facebook. In particular it can now share your slideshows directly with Smugmug – creating full 1080p slideshows that fit seamlessly into your Smugmug Albums. I decided to try this feature out with my newest slideshow – from our Southeast Asia photo tour in December – that I put together both in a “traditional” version and used ProShow 5’s “remix” feature to build a fancier version. Both shows exported easily, although the upload of the resulting video took quite a while, so give yourself plenty of time when you are publishing this way. Here is my original “simple” slideshow, created simply by placing images and audio into ProShow 5. Important viewing Note: ​If you click to view either slideshow full screen, and have a good connection, make sure and turn HD mode ON to get the full 1080p version! My favorite way to learn software is just to jump in and start playing. But if that isn’t enough for you, there are now some great books on ProShow. I can recommend both as great ways to speed up not just your learning curve on ProShow 5, but also general information and tips for making great slideshows. If you already know what you want to accomplish with your slideshows, then the Official Photodex Guide to ProShow is the book for you. It picks up where the online help and manual leave off. For a combination of information on creating innovative shows with a bent towards using ProShow , Secrets of ProShow Experts, by the original author of ProShow is packed with great tips and techniques. The book's only drawback is some questionable photographic advice (like only shoot in landscape mode), but the slideshow coaching is worth way more than the $26 buying the book on Amazon will set you back. Of course another great way to take some great photos and get personalized instruction on how to turn them into world-class slideshows and photo books is to join us for one of our field photo safaris which always include plenty of personalized instruction. We’ll be returning to Texas, Alaska, Southeast Asia and Botswana over the next year. Please think about joining us on a Cardinal Photo Safari! Full disclosure: Photodex is a site sponsor of nikondigital.org, but I was a happy and enthusiastic user long before that happened!